Are you a bro on spring break from college looking to score? Then you're going to hate this place! Which is exactly why we loved it. After the overdevelopment (and the relatively high prices and lack of pristine surroundings that come with it) of Koh Tao, we set our sights further south and on the other side of Thailand's peninsula, on the Andaman sea. 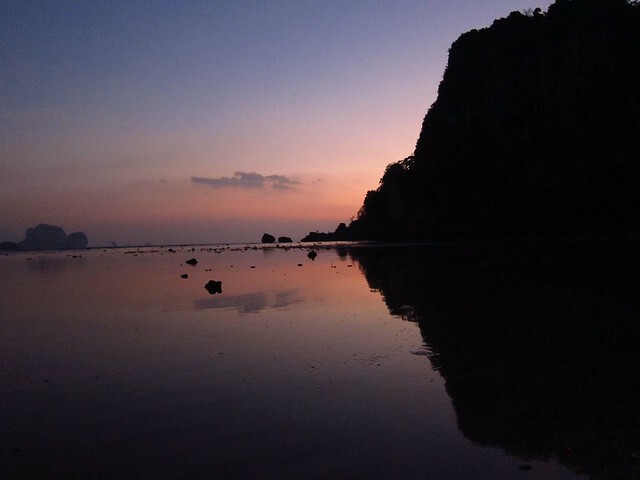 We picked Railay, a cluster of beaches on a penninsula that is cut off from the mainland by immense limestone cliffs rising right out of the ocean, and thus only accessible by longtail boat. This physical protection seems to have cut down on some of the problems of overdevelopment and unsavory clientele that plague many of the world's beaches, although it is by no means an undiscovered spot. There are four distinct beaches on this relatively small peninsula, and we made our home on Tonsai beach, the mellow collection of basic bungalows, food shacks, and laid-back beach bars inhabited mainly by a few dozen rock climbers worshipping the world-class limestone and filled our days with the perfect mix of climbing, sunbathing, and massages. The climbing was truly unique, challenging us with large, globular formations, huge stalactites, and imposing caves, and the puzzling discovery of seashells embedded in the rockface hundreds of feet up (the cliffs used to comprise the seafloor, many geologic ages ago). While we only visited three sites, we could easily see how many climbers happily spend months or years here without even scratching the surface of the available routes. Claudia got some pointers from one of the island's legendary climbers, Wee, who also showed her some bouldering moves to help up her skills, while I enjoyed some of the many rewarding routes, and struggled up a truly challenging one featuring a tricky move using a stalactite to exit the roof of a small cave. 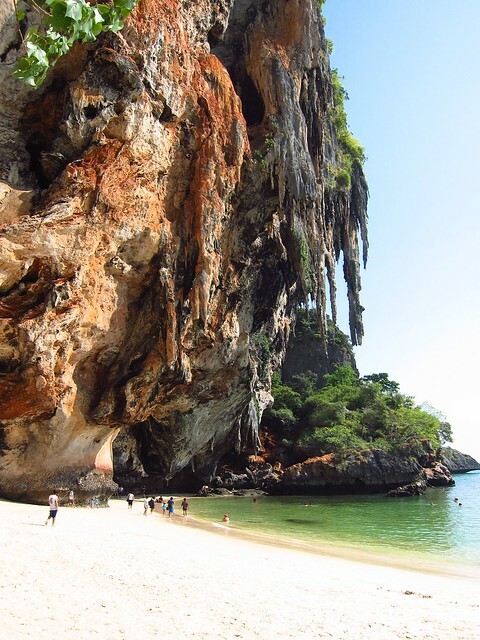 After climbing in the morning, we spent our afternoons lazing on the beach and admiring the huge cliffs in every direction. At night, we feasted on delicious, fresh seafood and Thai curries, and passed the time at the most relaxed bar scene we've ever seen, where beachside hammocks, fire juggling, and exchanging stories about the day's climbs replaced 80s music, bright lights, and bikini contests. Khao San Road, Bangkok » « Koh Tao: Slightly Underwhelming but Relaxing Nonetheless!